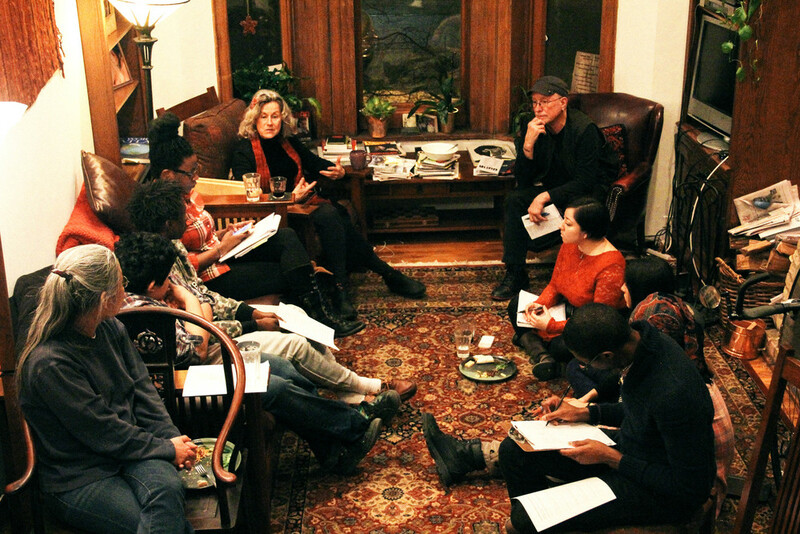 Cities of Peace Fellows gathered as the home of Bill Ayers and Bernadine Dorhn for dinner and discussion. This week Peace Fellows sat down with international human rights activists and scholars to explore how we build solidarity across cultural and political difference and create space for radical imagination across boarders. Our conversation took place in the home of activist and educator Bill Ayers and juvenile court and international human rights attorney Bernadine Dorhn. We were joined by educator and organizer Lau Ramirez who has been organizing with families and young people in Ayotzinapa, Mexico following the disappearance of 43 students teachers this September, Nana Ofori-Atta a Ghanaian-American leader in economic development and civil society working with the UN, and Kaoru Watanabe who is the Program Director of the Cambodian American Heritage Museum with decades of experience doing doing global public health work in Egypt and direct service with Cambodian refugees in the US. 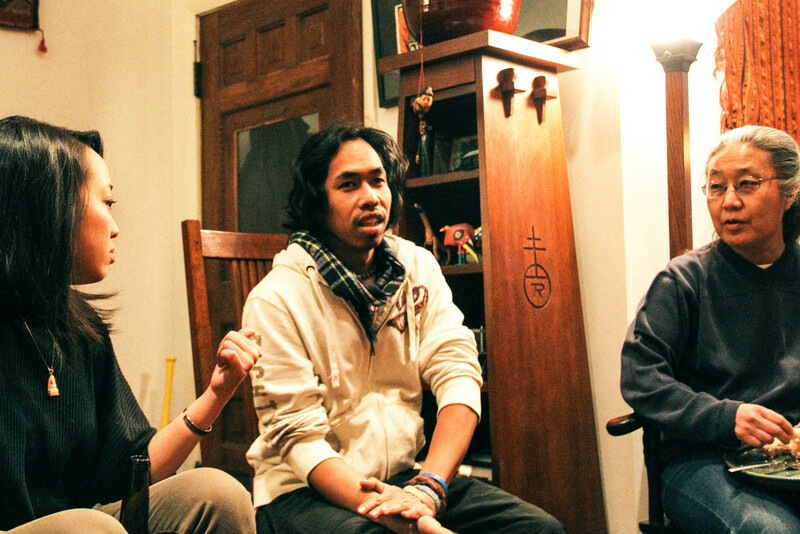 Kaoru Watanabe (right) sharing her stories and perspectives with peace fellows Alina (left) and Johnny (middle). "Our Cities of Peace meeting and dinner at Bill and Bernadine's house felt so wonderful, to sit and eat together felt like we were family for years. They opened their home up to us as if we were their grandchildren, greeting us with warm hugs and burritos. Opening up our session by imagining what we were currently having optimistic views about, hit home for me to speak from the heart. Bill and Bernadine made critical and valid points when they said showing pity to the opposite culture or race will automatically reduce the chances of us understanding who they are without seeming disrespectful or as if we are not all in the same bubble. No ones life is better or worse than another. I remember feeling as if I were better than the Cambodians due the fact that the United States is a more developed country than theirs. I even compared slavery in the US to the tragic experiences the Cambodians went through and I still thought that we had it better than them. What I didn't notice is that we all had one thong in common; Oppression! Bill and Bernadine had wonderful and powerful words about the way we treat and view one another whether we come from different backgrounds or places. What surprised me was that at the end of the session, I was imagining how humans existed when all forms of colonization and oppression didn't exist. The time when humans first evolved. I bet back then, we all worked in unity and solidarity. 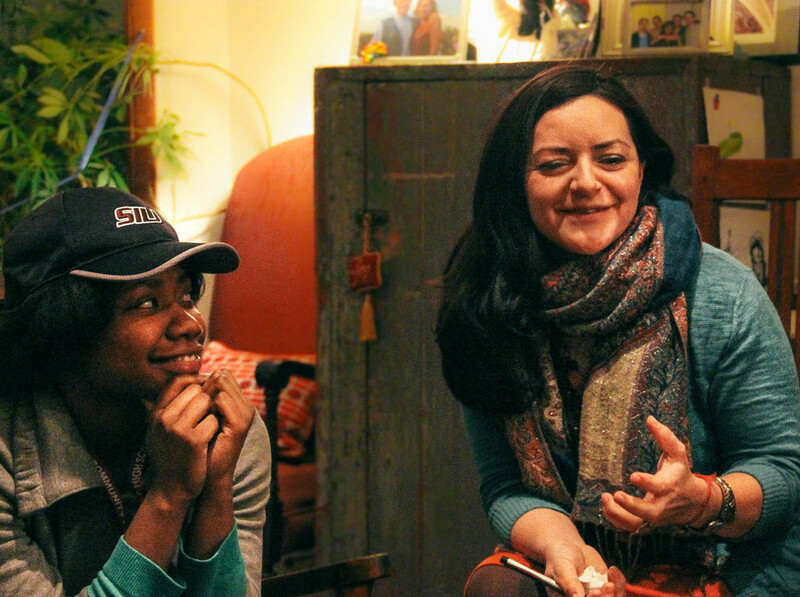 Peace Fellow Briana Johnson (left) listening to Peace Activist Lau Ramirez (right) share her story.